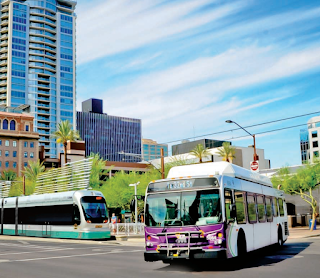 If you live in Phoenix, Arizona and haven't been on the Light Rail, well, you should. I had to go downtown last month and sit around for two days before being dismissed from Jury Duty and I decided to take the opportunity to use the Light Rail. And it's wonderful. Now waitaminute, I'm not promoting Light Rail for commuting, although I'm sure it's fine for that, and many people use it that way. I'm talking about adventuring on the Light Rail, and seeing Phoenix. If you're a middle-aged guy like me (which I guess is what I'm going to call myself until I'm 100), you probably don't even think about using the Light Rail. I have a perfectly good car in my garage, and all I gotta do is walk into my garage and drive anywhere I want to go without having to do anything but hold onto the steering wheel. And I've done a lot of holding onto steering wheels. When I worked downtown in the '90s, I drove back and forth every day from suburban Glendale. Sometimes I tried Grand, sometimes I took 7th Street. Either way I went I spent a lot of time staring at taillights, and traffic lights. I then drove into a parking garage, and went to work. Then I did it again, and again, and again, year after year, because that's what you do. A few years ago, after hurting my ankle, I got spoiled. I asked people to drive for me, and I started doing a lot of sight-seeing. When I visit friends in California, the shuttle picks me up, and someone else drives. I also let someone else fly the plane, so I can look out the window and drink coffee. I appreciate the nice people who hold onto steering wheels and watch taillights and traffic lights so that I can sight-see. If you're not into sight-seeing, riding on the Light Rail will just be boring. There's no steering wheel to hold onto, no tail lights to see, no stop lights. But if you like to see stuff, it's wonderful. 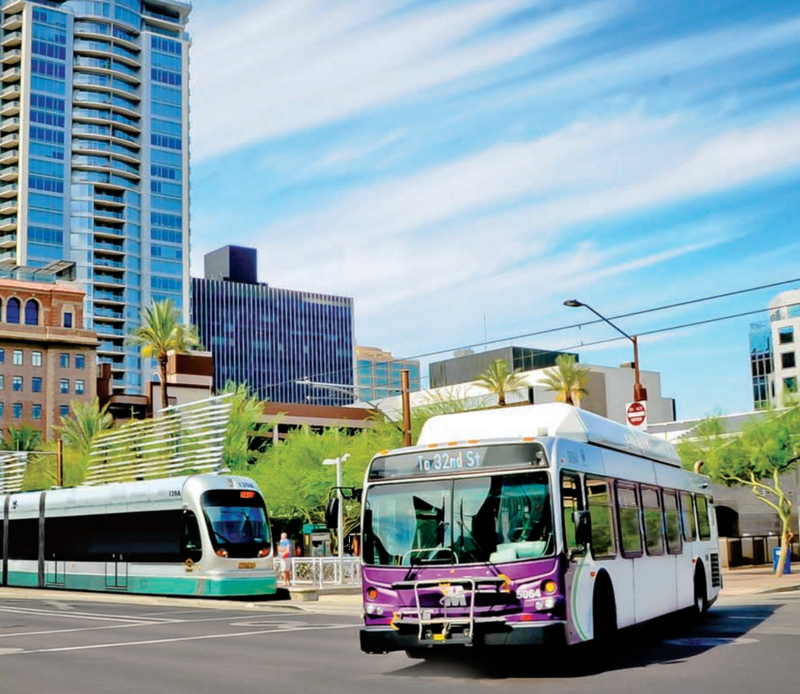 And the best part is that, although it doesn't stop as often as the bus, it does stop at the Light Rail Stations, and you can get on and off as much as you want (using a 1-day pass). 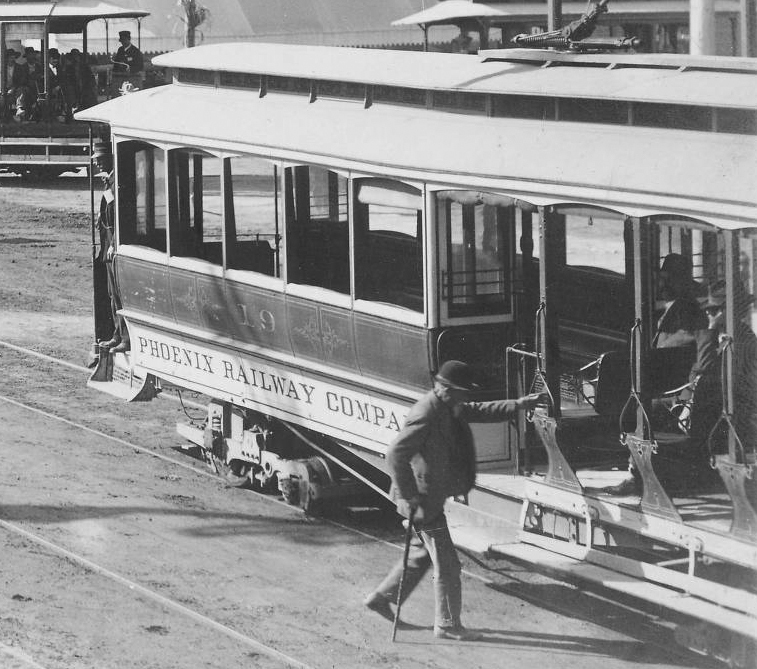 Electric trolley car in 1905, 1st Street and Washington, Phoenix, Arizona. When I'm adventuring, I keep in mind that most people aren't. Most people are just trying to get somewhere so that they can get back to where they started. For most people transportation is like being in an elevator. I'm sad for these people, but I understand that it's the norm. When I first starting flying for business, in my twenties, I remember how exciting it was to be thousands of feet up in the air, and I always got a window seat. Most people in the plane just sat there, read a magazine, or watched the in-flight movie. I would be looking at the ocean, or the mountains, and marvel at it. Yeah, I'm weird. So there you go. I know that the nice people at Valley Metro didn't build the Light Rail just to entertain me, but that's how I see it, and that's how I'm going to use it. 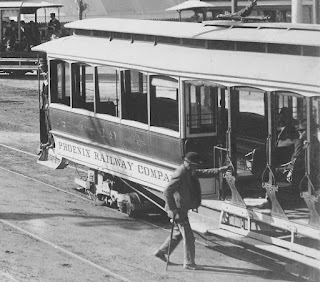 If I could, I would travel back in time and ride the trolley cars in Territorial Phoenix, but since I can't, I'll use the Light Rail and a bit of imagination. If you see someone with a gimpy ankle and a big smile on his face, it's me. Life is an adventure! Thanks for riding along with me.